Join us at 2 p.m. EST on Wednesday, February 4th for a special Facebook chat! 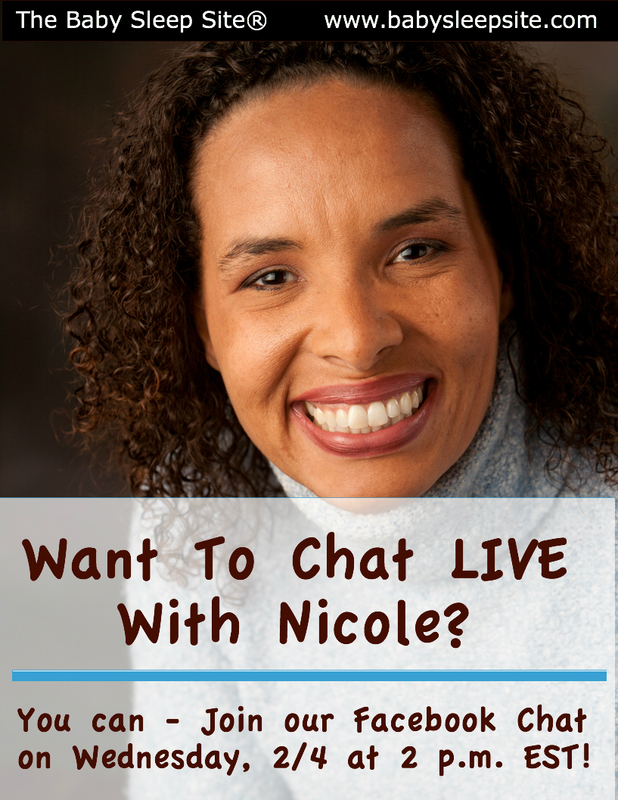 Have you ever wished you could chat with Nicole and ask her a specific sleep-related question? Maybe you have one or two quick questions that are stumping you, and that you’d LOVE to get Nicole’s take on? And don’t forget to spread the “sleep help” love, and invite your friends to this event! Nicole is sincerely hoping to help as many people as she can through this chat, so if you know friends or family members who are struggling with sleep, please – invite them to attend! Or maybe you know a few new moms who would benefit greatly from Nicole’s wisdom – invite them along, too! You can click here to join the event, and get updates and reminders. Get those questions ready, and we’ll see you on Wednesday, February 4th at 2 p.m. EST! *Remember that Nicole will have limited time during the chat, so you’ll want to stick with straightforward, specific questions. Additionally, if you can’t see Nicole’s responses immediately, try refreshing your browser periodically, so that you can see the most current questions and answers. Finally, keep in mind that this chat isn’t designed to replace one-on-one work with a sleep consultant – if you have loads of pressing sleep concerns, then you may want to pick up a sleep consultation package, and work directly with a trained consultant. 6month old waking up frequently and thinks it’s time to get up at 430 am every morning. My son has never slept much. Too nosey and will fight the tiredness in day. I have to put him in his cot in day few times and shut door for him to nap in day and he will for upto 30min a time. He has a strict routine. Bottle at 6 bath and cuddle n bed. He falls asleep quick and easy into a deep sleep. He will sleep 4hours ish then wake up hungry. So bout 10 il feed him. He will drink all bottle.change him and will go sleep straight away. @ kieghly – so sorry to hear that you’re struggling! Have you downloaded our free guide yet, by chance? That will help with any sleep associations that may be keeping him up. You can download it here: 5 Ways To Help Your Child Sleep Through The Night As for his tummy trouble – do you think he might be constipated? Sounds like that may be an issue; if it is, try offering high-fiber foods. “P” foods are usually great – pears, prunes, peaches, etc. – for helping alleviate constipation.